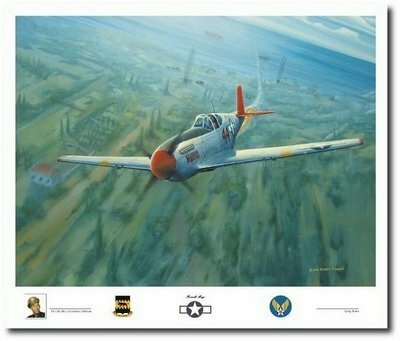 Overall size: 26" x 22"
August 12, 1944 was a bright sunny morning over the southern coast of France as 16 P-51s of the 332nd Fighter Group, in flights of four, approached their target: radar picket sites on the cliffs above Toulon harbor. Lt. Alexander Jefferson was the fourth plane in the last group of four, Tail End Charlie. After experiencing difficulty releasing his wing tanks, Lt. Jefferson found himself lagging behind the rest of the formation and redlined his gauges to regain his position for the attack run on the target. The targets, radar antennae, were used to detect ships approaching the harbor, and they would greatly hinder the planned invasion of Southern France, Operation Varsity. As determined as Lt. Jefferson and his fellow "Tuskegee Airmen" were to remove that hindrance, the defending German anti-aircraft gunners were equally determined to hang on their radar warning sites. Consequently, when Lt. Jefferson arrived over the target the German gunners having had 15 previous opportunities to practice were well prepared for his arrival. An anti-aircraft shell passed directly through the floor of his cockpit and through the top of the canopy, setting his aircraft ablaze. With only 50 feet of altitude between his aircraft and terra firma, Lt Jefferson pulled his burning aircraft up into a loop and proceeded to exit his aircraft. Like many young men of his generation he had named his aircraft after a sweetheart back home, he would never see either again. Having bailed out practically on top of the gunners he had been attacking, he was immediately captured, and spent the next nine months in a series of German POW camps. The painting, Farewell Margo, is representative of the sacrifice that Lt. Jefferson and many of his generation, regardless of race, were willing to make in order to rid the world of the evils of fascism. He and his generation put life, limb, and even love behind their commitment to duty, and in so doing created an inspirational legacy that has led to that generation being referred to as this nations Greatest Generation. As part of that generation, Lt. Jefferson and his fellow Tuskegee Airmen deserve an extra measure of greatness. They fought the twin evils of Nazism abroad and racism at home, and with grace and courage defeated both. Their victory in both arenas was a victory that made America a better place for all Americans. In today's armed forces African-Americans serve with distinction in all ranks and every career field. The U.S. military has come to embrace the talents and dedication of some of its most loyal citizens. Lt. Jefferson and his fellow Tuskegee Airmen had no small part in this. Their part was huge, and so is the debt owed to them. While it would appear that the young Lt. Jefferson was unlucky in both love and war, fate would be kinder to him. He would survive his captivity to return home to Detroit, Michigan, and retire from the Air Force Reserves as a Lt. Col., and retire as a Vice Principal in the Detroit public school system. Additionally, he would marry and raise two daughters. And, as for being unlucky in war Lt. Jefferson was informed by the German artillery officer who interrogated him in perfect English, that he had been lucky indeed. The anti-aircraft artillery shell that had brought him down had been set to explode at 500 ft. His low altitude of 50 ft allowed the unexploded shell to simply pass through his aircraft without exploding!